Dell Inspiron presents TGIRF 2 is back!!!! 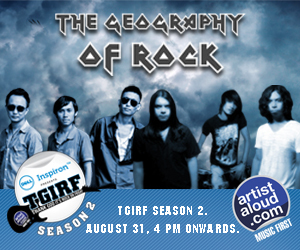 On this week’s episode of Dell Inspiron presents TGIRF 2 we showcase 2 amazing bands from the east one is Alobo Naga & The Band which is a Contemporary Progressive Rock band from Dimapur, Nagaland, formed in the summer of 2010. The Band comprises of five musically talented youngsters, hell-bent on creating good music and has several shows to its credit since its inception in Nagaland and outside the state. So did you get to go to HRC in Hyderabad on the 26th of July? If you had, you would have watched two of the most entertaining bands – Cadent Slaves opening for Thermal And A Quarter. But if you missed it you wouldn’t need to fret because that is what Artist Aloud is here for. To give you an opportunity to catch up on what you missed, we bring to you Rockstock only on Artist Aloud across http://www.artistaloud.com, http://www.facebook.com/artistaloud and http://www.youtube.com/artistaloud today at 4pm. Miss it and you will surely have missed a great concert. So what do you get when you bring 6 artists and music together? Well – you get Love In The Air. What else is possible with some of the most romantic voices like Shankar Mahadevan, Shaan, Neha Bhasin, Javed Ali, Alka Yagnik and Babul Supriyo? Produced and released via 92.7 Big FM, this is is an album that has a unique offering with melodies that are nostalgic yet new. We at Artist Aloud are very excited to associate with this album and make it available for you to download at just Rs. 20 for any 4 songs or Rs. 10 for a single track. Well, you may think wow that is very reasonable but trust me you are buying jewels at this price. Have you heard a Bollywood song and wondered who’s voice it is? Don’t you feel more and more that it is difficult to recognize the voice these days? Some of the most popular songs today belong to one such unrecognizable voice and that is Shweta Pandit. Shweta has been in the music space for a long time now and has also to her credit the honor of performing as A.R.Rahman’s entourage traveling with him around the globe performing at his shows. Kehdo Na is a new single that Shweta has launched through Artist Aloud and is in her own way giving her creativity the wings that she so wants to fly with beyond her Bollywood hits. So how long has it been since Shiamak Davar came out with an album? Too long one might say after listening to his latest album launched exclusively through Artist Aloud. He has style and he has rhythm and he brings it all under one with his 1st single from his new album titled SHABOP. Its the kind of track that you want tap your put to and get up and dance. And its like Shiamak says, “Have Feet, Will Dance”. Check out his video exclusively on the Shiamak TV. So do you know what SHABOP! means? Well it means Shiamak’s HIP HOP. When you look at this legend you cannot imagine what an institution he is in his own right! A singer, a dancer, a choreographer, a director, a theater personality and to top it all a wonderful human being. The entire Bollywood Industry swears by him and most of all each one ranging from a Shah Rukh Khan to a Tisca Chopra and all in between vouch for his warm and large heart. How can a human being so loved not come out with an album that will make a mark. Featuring some of the biggest artists namely Shankar Mahadevan, Hariharan and Swheta Pandit, Shiamak’s SHABOP! is a release after more than a decade. Exclusively available through Artist Aloud, this is one of the biggest offerings in the Independent Music scene we offer so far. To buy and own Shiamak’s music, click the image. Watch the official launch of SHABOP! on Intel Presents New This Week only on http://www.artistaloud.com on 20th Aug 2012 @ 4pm. The digital PRIME TIME!!!! !